The N-power programme and the P-YES Scheme are some of the popular empowerment programme created by Buhari Administration to empower and create jobs for Nigerian youths. These kind of programme should be recommended and encourage to enable more Nigerians benefit. Nigerian youths needs a sincere programme that will truly open up their eyes to opportunities, as the saying goes show me how to fish instead of giving me fish. 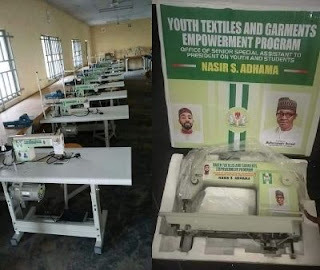 We know about N-power and P-YES, but there is this specific programme called "Youth Textiles And Garment Empowerment Program " Office of Senior Special assistant to President on youth and students. This particular programme is generating more attention from Nigerian youths and we think Government should put the necessary things in place in making that the programme come to reality. One of the way that government can reduce poverty is to massively empower the youths with skills, and I think the Youth Textiles And Garment Empowerment Program is one of such empowerment scheme that will create jobs if implemented Nation wide.